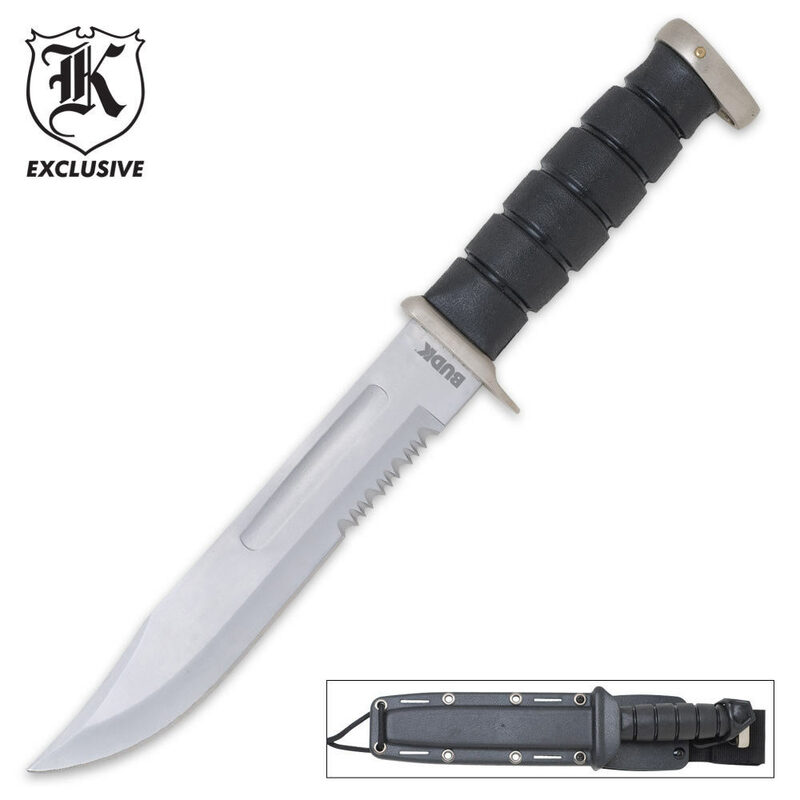 Own this Vietnam War-inspired combat bowie knife featuring a 7.25 in. stainless steel blade with a clip point and sharp serrated edge. It's designed after combat bowies used during the war, and also features a stacked-style rubberized handle. A molded military-style sheath is included to house and carry the blade. I've had a LOT of knives butthis one was by far the best especially for the price! I threw it into wood often and it stuck like a champ! Cleaned a few hogs with it too! Worked AWESOME! Use to keep it next to my seat in my truck but after cleaning a hog one last time I forgot it outside and I guess an Animal dragged my knife off. Needless to say I miss it dearly. BUDK PLEASE BRING BACK THIS BEAUTIFUL KNIVES!! Good length on the blade with plenty of handle to grip it with. Nice heft, balance and feel to the knife itself. Though it is not full tang, it feels sturdy and capable. The sheath is hard molded plastic with that familiar positive click to it when you sink the blade all the way in. You know what I mean. There is also a generous nylon belt loop with both Velcro and snap closures. The included lanyard can be looped through the sheath by means of slots or holes to your pack, pants belt, utility belt, leg or arm. With only a little ingenuity a shoulder carry position could be constructed with the right straps. Also on the sheath is a nice stretch rubber keeper which fits over the pommel. You would have to be very careless to lose this knife if it's secured correctly with all of these built-in precautions. Out of the box it can use a pass or two over a stone to bring it to a fine sharp edge, but the original edge on the ones I bought were really not that bad. I doubt you will be disappointed in this one, especially for less that 10 bucks. Nice heavy quality knife at a great price with a very durable sheath. Amazing value for the money. This knife is great. It was sturdier than I thought it would be weekend I bought it. It is well balance as well. Blade is Shattuck and holds a great edge. The sheath is great as well. The ABS sheath is solid and the leg strap is helpful. You can also sloop your belt through loop or it can be snapped appointment your belt. I lived it so Miuccia i went and bought two more to save as gifts for my family and friends. For the money, this is a top line hunting, camping knife. Keeps an edge and is easy to sharpen! Thanks guys! Great deal! I had gotten this knife today, and the only thing I can say about this is that it is AWESOME, works great too. Could be a pretty good combat knife too. Kind of reminds me of the knife off of Turok.